Have you seen backsheared anvil clouds? How do they look like? How do they differ from other cloud types? What weather condition do they bring? To learn the answers to these questions, read further. Backsheared anvil clouds refer to cloud formations when anvil clouds spread against the flow of the wind due to very strong thunderstorm updraft. 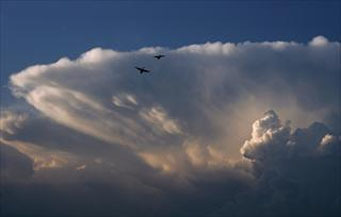 This cloud is often used in describing gigantic cumulonimbus clouds and is a significant indicator of severe weather condition which may or may not bring tornado. Sometimes, backsheared anvil clouds bring forth mammatus clouds at the base of the anvil-shaped cloud. This cloud formation, thus, is one variety of anvil accessory cloud and an early warning sign of an upcoming strong thunderstorm. How do Backsheared anvil clouds form? These cloud formations develop once the anvil cloud spreads back against the wind flow (or upwind) instead of spreading along direction of the wind flow. This happens when a thunderstorm has a very strong updraft (or rising warm air) and bumps against the base of the stratosphere which prevents it from rising further because it is warmer than the thunderstorm updraft. Backsheared anvil clouds sometimes generate mammatus clouds which are characterized by their sac-like downward protrusions at the base of the anvil cloud. At What height are Backsheared anvil clouds found? A backsheared anvil cloud develops beneath an anvil cloud which likewise forms at the top of cumulonimbus clouds. Cumulonimbus clouds can grow as high as 60,000 feet or more while the anvil clouds develop at the tropopause. The tropopause is the border line between troposphere and stratosphere. The height of the tropopause varies depending on the season, time of the day and latitude. Thus, if you live in one of the mid-latitude regions, backsheared anvil clouds can be found up to 50,000 feet above the surface. The higher the altitude a backsheared anvil cloud is found, the more severe thunderstorm it brings. How do Backsheared Anvil Clouds look Like? A backsheared anvil cloud has a sharp and crisp appearance with distinguishable edges. If they bring severe thunderstorm, backsheared anvil clouds exhibit a thick and boiling facade. This appearance is due to the strong divergent wind flow close to the top of a high-speed convective thunderstorm updraft. How common are Backsheared Anvil Clouds? These cloud formations are commonly seen when a severe thunderstorm is fast approaching. Backsheared anvil clouds are very visible during spring time and summer time and occur in worldwide scale. Backsheared anvil clouds are common sightings whenever there is an upcoming powerful thunderstorm. Taking a closer at this cloud formation not only enhances your cloud spotting hobby but likewise educates you as to the weather condition it brings.